Tonight’s blog post will be simple and to the point. You see, all I really want to say is this: Thank goodness for FaceTime! Recently, I have really enjoyed the capabilities of FaceTime for two main reasons, although both center on Sloan. First, my family on the other side of the country is truly able to see and get to know our daughter. Sure, it falls way short of being able to actually pick her up, feel her fuzzy head, or smell her sweet baby skin but it sure beats the technology we had at our disposal just a decade ago. At least on FaceTime you can hear her baby noises, look into her oversized eyes, and see the latest outfit she is wearing. You can also observe moments such as her bathing, eating, and moving her little feet and hands. For my family who is starved for anything Sloan-related, FaceTime is a godsend. It also isn’t that bad of a deal for me, either. 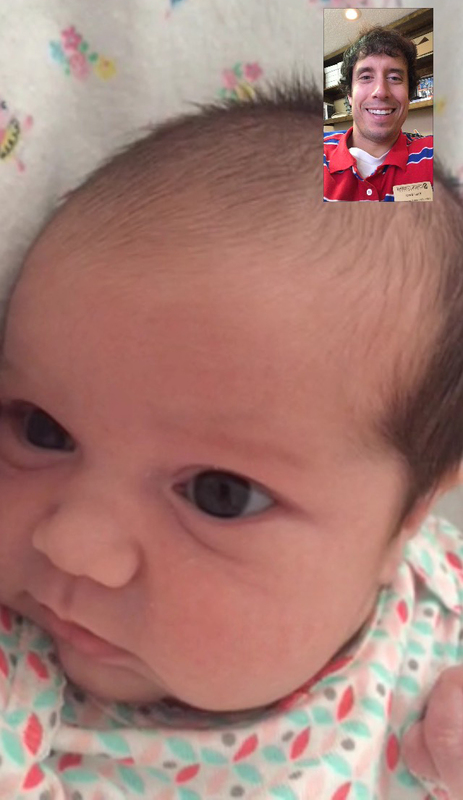 It is very rewarding to be able to FaceTime with Sloan. Yes, the second reason why I have really grown to like FaceTime is because I can utilize it to see Sloan as well. Up to two times a day at work (before the day gets started and during lunch), I will either “call” her or she will “call” me. Sidney is great at moderating these sessions and it is the biggest jolt of energy you can get during the work day. I know the FaceTime calls will likely diminish over time, but as a new dad who is still struggling with leaving her behind for several hours during the day, these “conversations” are very much appreciated. I would like to give a big THANK YOU to the inventor of FaceTime. I don’t know where my family and I would be without it! Don’t Blink. This entry was posted in Uncategorized and tagged FaceTime, FaceTime babies by brent. Bookmark the permalink.